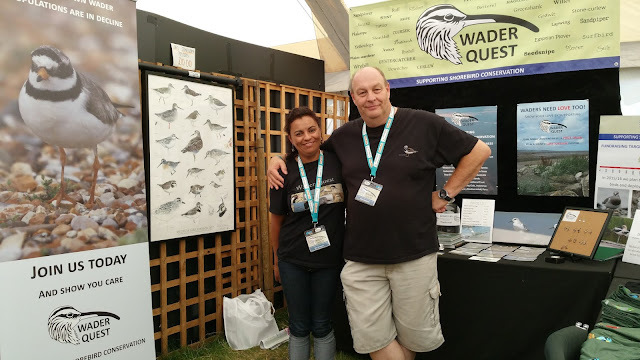 Wader Quest: Birdfair; all done and a great weekend as always. Birdfair; all done and a great weekend as always. The calm before the storm. The Wader Quest stand ready and awaiting visitors. The first people we want to thank for this marvellous weekend are Carole Allen who organised all the exhibitors so well putting up with all our daft questions and incompetent organisational skills and also Tina Lindsay who organises the talks for giving us the opportunity again to talk to the birding public. Tina Lindsay on a brief visit to the stand. In addition we should thank our friend Tim Appleton and all those incredible volunteers who make the whole thing run so smoothly. Tim on his new mode of transport for the fair. We must also thank our volunteers this weekend too who helped out on the stand releasing us for short periods to get out to see people that we only get to see once a year at the fair. John Davis came to see one of our talks and afterwards volunteered his time to help us at the Bird fair. John spent most of Friday helping out at the Wader Quest stand. Volunteer John Davis on the stand on Friday. Also Trustee Chris Lamsdell and his wife Denise who spent a vast amount of their time covering the stand on all three days and also talking to people as they went around the marquees on our behalf. Thanks too to the other Turstees who passed by the stand although busy themselves on other stands; Lee Dingain, Rachel Walls, Sue Healey, David Lindo, Oliver Simms and Allan Archer. Chris and Denise Lamsdell with Wader Quest Rob Young of Birding DC one of our Corporate Sponsors. We had some fantastic prizes this year for our raffle and competition with some excellent artwork from Richard Allen, Steve Cale and JanWilczur plus a pair of binoculars from Opticron. To all of them we offer our thanks for their generous support. Talking of artists we can't forget Robert Parkin who produced a magnificent artwork of one of our favourite birds, the Northern Lapwing. It featured on the T shirts that Elis and I wore at the fair and was one of the postcards which were for sale. We hope that this artwork will feature much more in the future in our merchandising. Robert Parkin's fantastic design with our new slogan. So of course we must also thank all those that attended our stand. With 380 to choose from we are always amazed at the interest our humble stand creates. To everyone that took the time and trouble to stop by and especially to those that attended the talk, we offer a big thank you for your support. We should especially mention Mark and Michelle Cornfield who have been kind and continuous supporters and friends of ours since we started and first appeared at the Bird Fair. The opening slide from the talk. 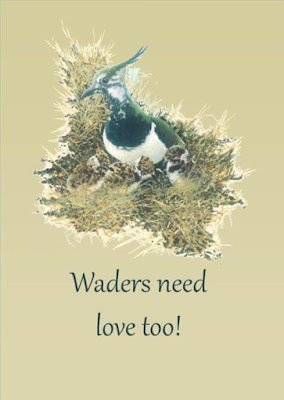 We were very pleased with the number of people who took an interest in Wader Quest and what we were trying to do with offers of help and advice coming thick and fast, all of which was received with much gratitude and we say an especially big thank you to those that put their faith in us by joining Wader Quest, without you there would be no future in what we are trying to achieve. The stand attracted plenty of interest. We sold a good number of raffle tickets, not surprising when you consider the prizes. The winners of the raffle were; 1st Prize (Signed print of juvenile Calidris sandpipers by Richard Allen) went to Jo Gould one of our most active followers on social media, particularly twitter so a just reward for her support; 2nd Prize (Jan Wilczur original line drawing of a Long-billed Dowitcher) went to Mike Harmer who had joined at the Norfolk Bird and Wildlife Fair; 3rd Prize (Jan Wilczur original line drawing of a Pectoral Sandpiper) went to Julie Robinson who had travelled all the way from Cumbria for the fair; 4th Prize (Opticron binoculars) went to John Todd who we are still trying to contact. The competition this year was to guess the number of birds in a photograph of a flock of mainly Red Knots in flight. 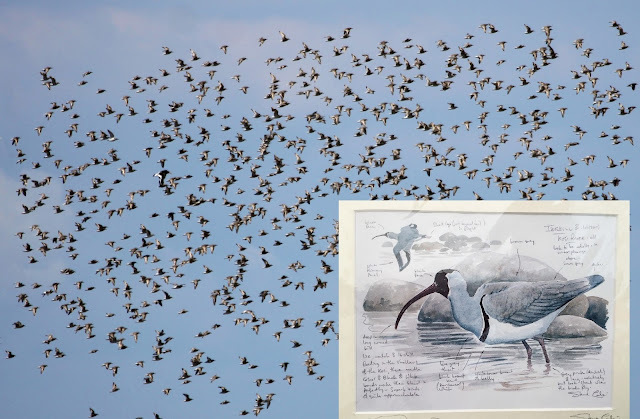 The total number was 1118 and the nearest guess was 1176 by Michael Hicks who will receive a beautiful signed print of an Ibisbill by Steve Cale. Competition picture with prize inset. Sales went well with the pins doing particularly well as usual, the new Dunlin being by far the most popular, we also started to sell some lovely little figures of waders made and hand painted by Styewart Langworth who had been exhibiting in the Art Marquee with the British Decoy Wildfowl Carvers Association (BDWCA). The 2016 Wader Quest Calendar launched at Bird Fair. As always there were very few downsides to this year's fair, it was good to catch up with many old friends, but as we were so much busier this year many got missed, we also missed the carts of food coming around the marquees, this will have affected many like us who find it hard to get away from the stand to eat. Part of the crowd in our marquee. The biggest disappointment though has to be that someone thought it was a good idea to pay for their Wader Quest Collectables pin badges by substituting £1 coins for 5 Sri Lankan Rupee coins - seven of them. With the cost of the pins and cards to manufacture, that cynical act has cost Wader Quest over £10.00 in lost revenue and for a non-profit organisation that is hard to take. Overall though it was a magnificent occasion as always, fantastic camaraderie, friendship and friendliness, co-operation and support. The British Birdwatching Fair is a unique occasion and we would not miss it for the world. Rob and Chrystal Young of Corporated Sponsors Birding DC. John Kinghorn of Founder Corporate Sponsors Birding Ecotours. György Szimuly of World Waders (I hate standing next to him, he makes me look so small!). Three lovely folk from the Wildfowl and Wetlands Trust; Nigel Jarrett, Ellie Wise and Baz Hughes. Friends from Brazil Fred Crema and Guto Carvalho. The lovely Vanessa Palacio from the equally lovely Extramadura. Another year notched up; the Wader Quest stand 2015. Photo: Lee Dingain.